A big welcome today to Nic Starr as part of her blog tour for Storming Love: Tsunami - Sebastian & Owen which is book 3 of the Storming Love: Tsunami series from MLR Press. Sebastian & Owen is book #3 in the Storming Love: Tsunami series from MLR Press. Three authors each contributed a story about a couple facing the same tsunami event. This book can be read standalone. 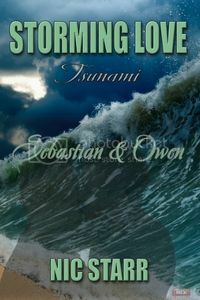 Sebastian & Owen is part of the Storming Love: Tsunami series from MLR Press. I didn’t have any thoughts of writing a story about a tsunami but was immediately intrigued when the concept was proposed by the publisher. They asked if I wanted to take part and after some consideration, I agreed. I was initially hesitant because I’d lost a friend and his wife in the 2004 Boxing Day tsunami and thought the topic might be a little too close to home to write about. My friend was on his honeymoon, celebrating what should have been the start of a wonderful life with his new wife, when it was all brought to an end. However, this (fictional) tsunami was set in a completely different area and gave me the chance to give a couple their happy ever after. I also chose to write about an existing couple who were battling other challenges in their relationship when the tsunami strikes. Interestingly, this story started quite differently for me in that it involved a lot of research up front. I spent countless hours browsing the internet to find out all I could about tsunamis and the chances of one of them impacting both Australia and New Zealand. This research led to identifying an area where seismic activity could trigger such an event. On the good news front, I discovered that the south-east coast of Australia, where the wave would hit land, would be relatively safe in terms of impact. I do hope you enjoy reading Sebastian and Owen’s story, and getting a little glimpse into Tasmania. Do check out the other books in the series to, to meet other great couples who are facing the same tsunami. Each book is written by a different author, set in a different location. The prize is a $10 Amazon Gift card. The Rafflecopter will start shortly and close on 18th October.